As a kid, I used to sneak into the pantry when my parents weren’t around and tear off a little corner from the block of dried tamarind that was guaranteed to be aplenty in our house. I would pop the hard knob of tamarind into my mouth, looking like a baseball player with dip wedged into my cheek. Then, I sat back, slowly sucking on the tamarind and letting it soften then dissolve in my mouth. The sour, fruity sweet taste permeated through my mouth. As my sour high came to an end, I would be left with just the fruit’s seed and a few of the veiny, fibers. If I was feeling brave, I might go back for a second fix. And so began a lifetime obsession for anything which would indulge my palette with a sour kick. And a lifetime of visits to the dentist! For the majority of my adulthood, I’ve done a half decent job of avoiding sour foods in favor of not giving away our life savings to my dentist. So I was more than pleasantly surprised when my dad brought me a box of tamarind candy. These little tamarind gum drops are dried pieces of tamarind mixed with chili powder and salt and coated with sugar. They are the ultimate sour-sweet candy fix. I managed to wait a few weeks after he brought them before I cautiously broke the box’s seal and popped one into my mouth. I closed my mouth, shut my eyes and positioned the tamarind gum drop between my tongue and top of mouth, gently letting it dissolve as sour, sweet, spicy bathed my tongue and puckered my mouth. And this time, I didn’t even have to sneak it! 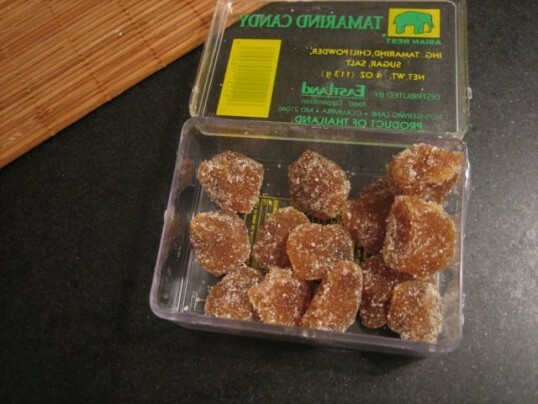 You can find tamarind candy at any Indian or Asian grocery store and you can even order it online here from Amazon. If you want to try your hand at making your own, Indira at Mahanandi has a recipe for tamarind lollipops. I haven’t been able to think of many uses for tamarind candy other than to indulge my sour cravings. You might make a tamarind cocktail then skewer two pieces of candy and place them in the glass. Any other ideas? Of course, there’s a lot more to tamarind than just tamarind candy. Tamarind is commonly used in Indian cooking, and I recommended it awhile back in this post as one of the top 10 Indian spices to stock in your pantry. Tamarind is the fruit of the tamarind tree, which grows in a number of tropical countries. The fruit of the tree, when ripened, is inside of a dry, brown pod. Inside of the pods, you’ll find a dark brown, slightly sticky substance with shiny, blackish-brown, flat seeds inside of them. Here’s a link to more scientific facts about tamarind trees. South Indian cooking relies heavily on tamarind to add a sour punch with mild fruity, sweet undertones to a variety of dishes ranging from sambar to rasam to chutneys. Nowadays, tamarind comes in many different shapes and sizes. While you can find it fresh in its dry pods at some fresh farmer’s market (like the Dekalb Farmers Market in Atlanta), the more common forms found in Indian grocery stores are blocks of dried tamarind, tamarind concentrate (a common brand is TamCon) or tamarind paste (common brands are Laxmi and Swad). The tamarind block is fresher than the concentrates and pastes, but it requires a little more prep work. Tamarind Block – Tear off the required amount of tamarind and soak it in a small bowl with enough hot water to cover the pieces. After a few minutes, when the knobs become soft, use your fingers to pry apart the pieces and separate out any seeds. Squeeze the softened pieces of tamarind between your fingers until the knobs are broken up and you’re left with a pulpy liquid. Strain through a sieve to remove any remaining seeds and fibers. Tamarind Concentrate – Mix the required amount of tamarind concentrate with a little bit of water in a separate bowl from the dish you’re preparing. Create a tamarind slurry and then add it the dish. If you add it directly, the concentrate will not mix in thoroughly. Use less water if you’re preparing a dry dish. Tamarind Paste – This is the type of tamarind that I keep on hand in my kitchen. I used to use the concentrate, but this inevitably led to whatever I was making being way too sour. Since the paste is less concentrated than the pure concentrate, you don’t need to use much water at all before mixing it in to your dish. You can remove a little liquid from your dish, mix the paste into the liquid and then add it back to the pot together. Substitute – You can buy tamarind at any Indian grocery store, but a substitute, that’s more readily available, is lemon juice. The taste is not exactly the same, but for most recipes lemon juice provides either the same taste or a slightly different type of sourness that’s equally tasty. Eggless Cooking – a blog dedicated to eggless recipes. Although I do (now!) eat eggs, Madhu’s eggless recipes are healthy and you don’t miss the eggs. Food Blog Search – although this isn’t a food blog, it’s a really handy tool that let’s you search more than 3,000 food blogs. I’ve just added hungry desi to their search engine and wanted to share it with you. fresh365 – a collection of vegetarian recipes that use fresh, seasonal produce with tantalizing photos and creative, tempting recipes. Holy Cow! Vegan Recipes – “meatless, eggless, dairyless and all-other-animal-product-less” recipes from Vaishali, a blogger who loves food and animals but doesn’t “care to mix the two”. A theory that applies to me although admittedly, I’m sure there are a few stray animal by-products in my kitchen that I’m ignorantly unaware of! Passionate About Baking – a blog dedicated to baking by Vindee Deeba (too accustomed to seeing Deeba’s twitter name! ), who truly is passionate about her baking! I am amazed by the sweets that she’s constantly churning out of her kitchen. My palate is more tuned for savoury, but I get my sweet fill by reading about Vindee’s treats. Pithy and Cleaver – Lest you were thinking all vegetarian was a requirement for making my favorite food blog list (it isn’t), here’s a blog from two NY based designers with recipes that use fresh, seasonal ingredients and always incorporate some witty, funny story that keeps me entertained. There are a lot more food blogs out there with tempting, well written recipes by engaging food bloggers, which I’ll surely get around to adding soon. Let me know what your favorites are! ND: Thanks Chitra! Be forewarned that it’s pretty adictive! Thanks so much for including us in your roundup! A tamarind cocktail with these as a garnish really sounds tasty! Thanks so much for including me! I am on the left nav twice- not that I mind! I can’t wait to check out these other blogs… I like the sound og this tamarind cocktail! ND: I really wanted to make sure no one missed the link! J/k. Thanks for catching that. I am thrilled to be included in your updated list– thank you! ND: I know, I had to get up and eat a piece while I was writing the post 🙂 Love reading your blog! And I’m also a sucker for tamarind cocktails…lychee too! ND: Wow, I’ve never done anything with the seeds. Do you just roast them like you would pumpkin seeds? What’s the flavor? I ate them just yesterday for the first time! Awesome taste, it’s so weird having a sweet candy at first that turns a bit salt & then spicy lol!